The Block of the Month is Be Merry and we each chose our own fabrics, so this will be an interesting reveal when we finish them up! 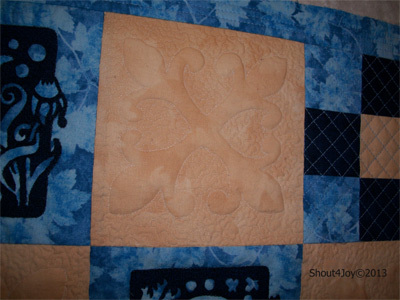 In the blank squares I quilted a fleur d lise pattern (BTW, the color of the beige is pretty true in this picture, but the medium blue is better in the next one). 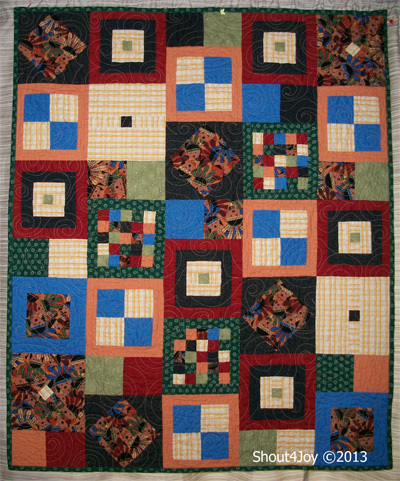 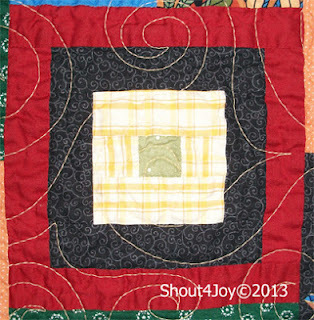 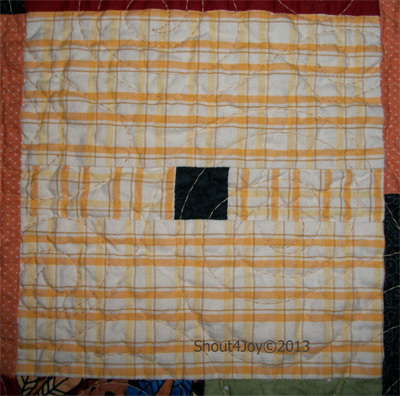 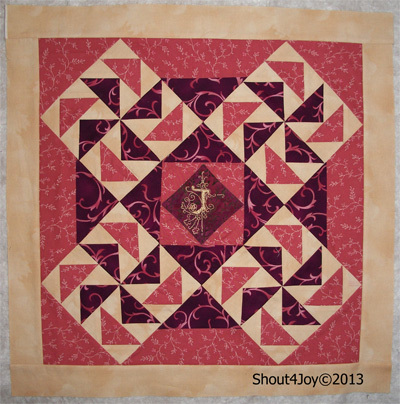 The Nine patch blocks in the corners received a cross-hatch quilted pattern. 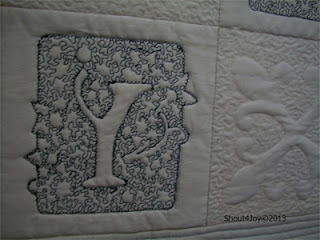 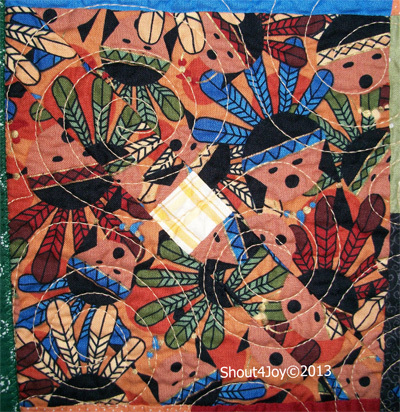 The quilt uses a beautiful blue leaf print, a very dark blue TOT and a beige leaf TOT. 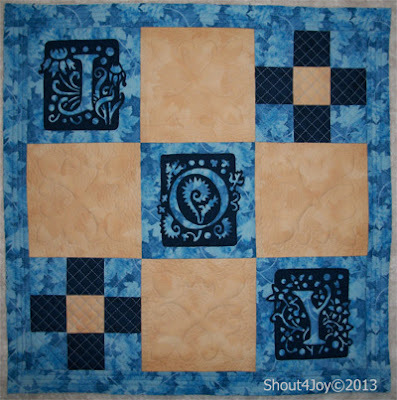 I made four Dutchman's Puzzle blocks (one of my favorite blocks) and then designed a setting for them. The center needed a bit of punch, so I embroidered a J in the very center on a scrap of a favorite batik (I only had a very small scrap of it left). 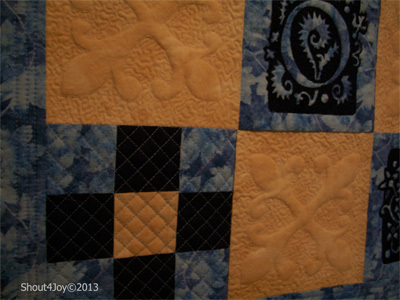 No decision has been made as to how I'm going to quilt this piece, it has remained silent :( That was another reason to finish up the blue quilt! 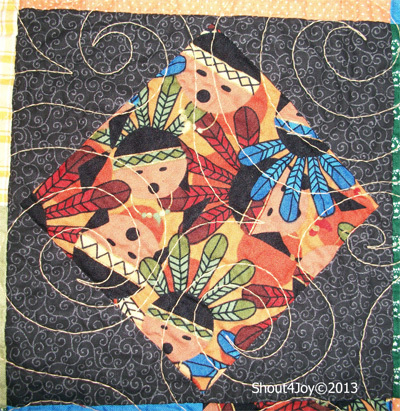 I'm thinking this will be the other side of my bag :) It'll be my split personality bag. I have passed the half way point :) I'm almost done with Block B and half done with Block A, YAY! This quilt will be set aside for a week as I work on whatever challenge Project Quilting throws out tomorrow. 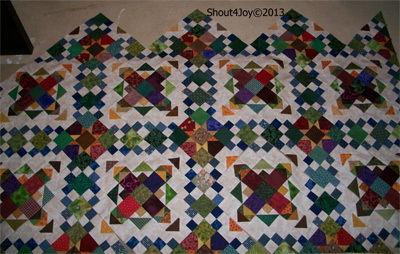 Not the greatest of pictures, but it is hard to stand on the futon to take pictures of the floor! 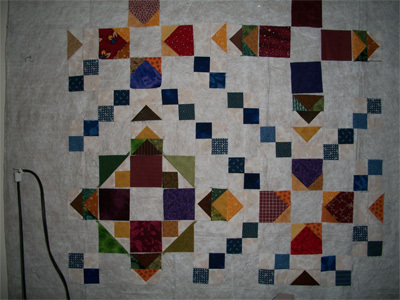 My design wall is just too small for this quilt. All of the corner and setting triangles are finished for my version of Easy Street and I have 4 of Block A finished :) I used the blocks as leaders and enders for each other. 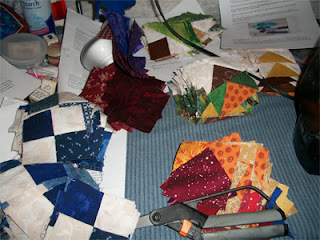 This way, I could just keep sewing. 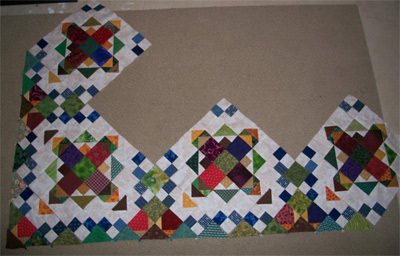 I broke the sewing up into only doing 4 blocks at a time. If I tried to do them all, I would end up not counting right and have to do a ton of ripping (I only had to rotate two units out of the first 4 Block As). 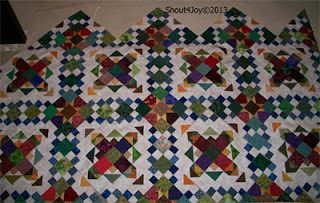 Note: I switched out the centers for the Blocks A and B and am really excited about the color change. 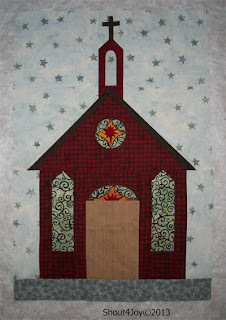 For more Design Wall inspiration for your Monday, check out Patchwork Times! 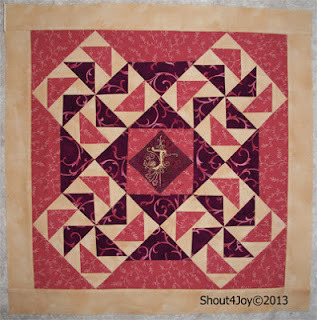 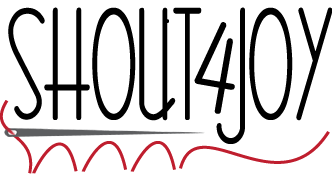 I am going to make the effort to keep up with Project Quilting this year :) Since the Army Guy is not being transferred this Spring, I might be able to hit all the challenges! My first submission is All Squared Up a baby quilt that will be donated through my Quilt Guild Patchers At the LakeShore to one of the local charities. 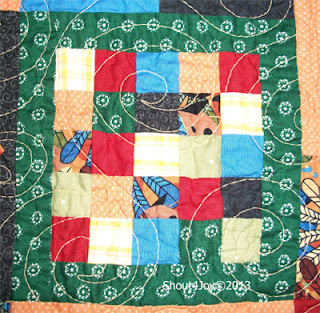 This quilt measures 32" X 39"
My design process began when I saw the cute little kid print on the stack of fabrics at our guild meeting. 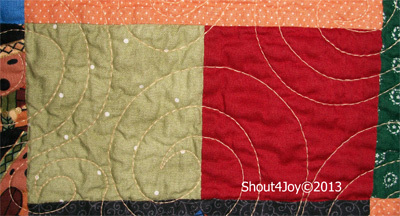 The fabric just spoke to me (well, maybe it was singing, look at those faces!). The fabric was begging to be used and the challenge gave me an excuse to get it done quickly! 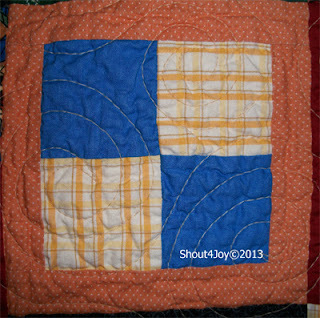 And the quilt came together! 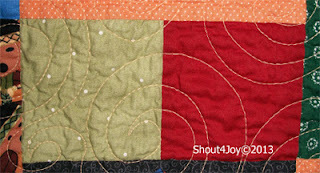 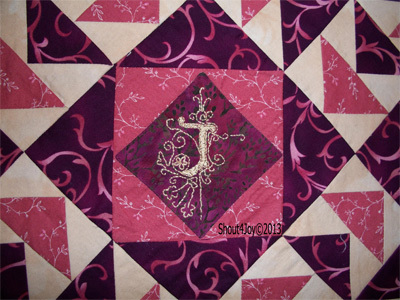 Add in a swirling freehand quilting design, a binding (zig-zagged down for durability) and we have a finished quilt!